Hunting in North Africa. 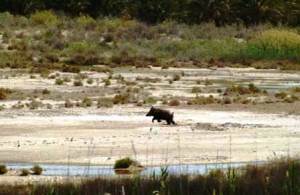 Boar hunting in Tunisia. on January 27, in the South to 30 April. Tunisia occupies an area of about 162 155 sq. km. Length of Tunisia 1200 km, width 280 miles to the North and East by the Mediterranean sea more than 1250 km and is bordered by Libya, on the South (480 km) and Algeria in the West (1050 km).Part of the Maghreb in Northern Africa occupies an important position in the Strait of Sicily in the Eastern Mediterranean sea. Strait Of Sicily between the Peninsula of cap Bon and Italy, 200 km wide, is one of the the busiest waterways in the world. off-road vehicle. A minimum of 6 hunters, not more than 12 hunters. Rates depend on the number of hunters, the number of hunting days and dates. 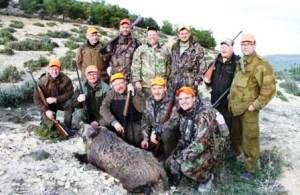 Hunting licences, insurance for hunters and beaters, transport in airport and hotel, hotel accommodation, full Board, support skip weapons in Tunisia, guide hunting, beaters and dogs for hunting, transport for hunting. There may be additional costs: a fine of EUR 10 for the wounded wild boar, 10 euros per night for a single room in the hotel, phone calls and other Accommodation is available in the hotel located in a small remote mountain village 90 km from the capital Tunis, a three-star hotel is known for its popular with hunters.